On the Estate that my son keepers, they welcomed the local otter hounds yesterday, A brilliant day was had by all, Tradition at its best, no creatures were harmed, but four hours of fun for all concerned, Hounds especially. Before otter hunting was banned I went out with several packs. It was great fun but I did start to feel uneasy about it so I stopped going. The mink hounds are a great alternative. The syndicate carp lake on the estate has been completely otter fenced after fish losses, but mink are regularly trapped, the latest only last week. Lovely hounds though, and informative and knowledgeable staff. Yes that was mentioned, that's a shame. Is only a matter of time until that number falls further, no longer being used for the purpose of hunting so less likely to be bred. Would be a shame to lose the breed though. Any pictures?? Lovely looking dogs but I've yet to meet one. I'm curious if mink are getting past the fence how are otters not? The mink were trapped outside of the fence, in adjacent woodland, bordering the lake . Touch wood, there has been no evidence of either species getting through the fence since its construction, although otter prints have been found outside of the enclosure. There were photos taken, I will try and get hold of them if I can. cheers, we looked at the breed years ago, books say they like to bark and can clear a two metre fence!! Shame because everything else is ideal good feet coat great nose. Pure bred otterhounds even as working hounds had there detractors, among other things they had I believe a reputation for fighting in kennels. Most working packs of mink hounds hunted a mix of foxhound, Welsh foxhound and crosses of same with some otter hound blood in the mix too. Until July 4th 2017 we were the proud owners of Bramble the Otterhound. Growing up on the North Kent marshes in the 50's I skipped school many times to follow the otterhounds (or the foxhounds). If any of the otterhounds were injured during the day, (barbed wire, strains, etc) they would stay with my Grandfather (the shepherd that covered all the marshes the hounds worked) for a few days and we became use to the big, hairy and friendly dogs. It was always my hope to own one when I "grew up". Otter hunting was banned in the late 70's and the breed numbers started to fall away. I lost my last gundog in 2012 and we went looking for an otterhound. After 12 months of visiting his kennels and much persuasive talk, I was able to buy a pup from Richard Griffiths Master of the Pembrokshire and Carmarthen Otterhounds, one of the oldest packs in the UK, he now hunts them on mink. A very interesting read, thanks for that, The pack that attended the estate was thirteen and a half couple, of these, probably only about seven couple were pure Otter hound, the rest made up of fox hound and mixtures. There were various coat colourations as well. On the day it was basically a meeting of a pack, plus another enthusiast who brought along two couple of pure Otter hound. There are variations among true pedigree otterhounds and if you look back at old paintings, photographs you will see evidence of this. 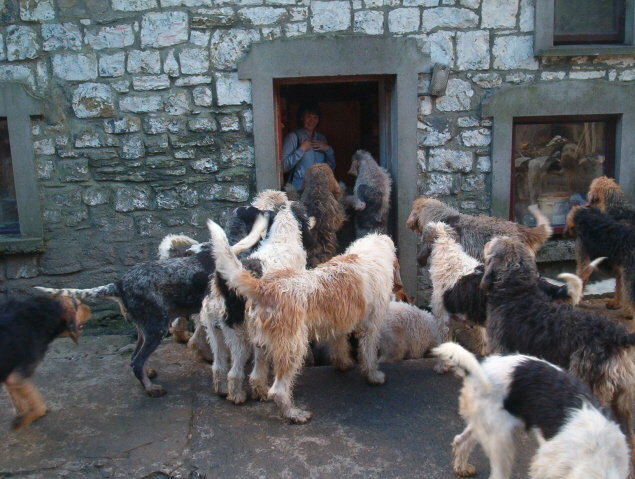 The show otterhounds tend to mainly be bred for a standard coat colour, but tri colour hounds and other variations are still true ottterhounds. My wife "under siege" from some of Richard Griffith's pack. 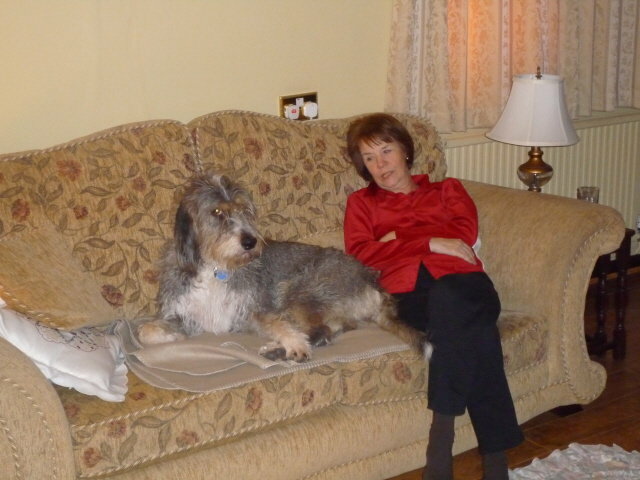 Bramble and my Wife (who spoiled her when I was out) . Great Photos, the coat colour variations in your photo of the pack, were very similar to those that attended the Estate. They're fair sized beasts, aren't they just?! They are very strong and can swim all day, thats where the size and the waterproof coat helps. I must have seen over a hundred otter hunts and never saw the hounds kill an otter. They worked the otters out of the large rush fleets on the North Kent marshes and trailed their scent on the water and on land. Being mostly in the water they were no where near the speed of the otter and being scent hounds, if the otter left the water and ran overland to another stretch of water, they followed the scent and not the sight of the otter on the land. I have seen otters repeatedly coming up for air right among the pack and still make good their escape. All the otters I saw killed were despatched by terriers being entered into tree roots, holts, or similar debris, where the otters had laid up. Otters were considered great pests in those days and were even partly blamed for the collapse of the seawall, when the Thames flooded the Kent marshes and Canvey Island, Essex in 1953. A bit fanciful , but a sign of the times. Same information I received when I asked about how often otters were killed, basically never, and as you say it is the speed and agility of the otter in water that gives it a massive advantage over the hounds. Great read. Myself and bunch of friends used to look forward to mink hounds coming up here to Northumberland,river Coquet ,Wansbeck etc.Thoroughly enjoyable. Same with the greyhounds for organised coursing.One day they had 21 courses and two puppie runs and not one hare killed! the club members were over the moon and could not believe the quality of "our hares".